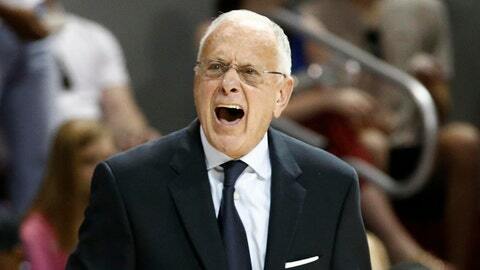 Mar 1, 2014; Dallas, TX, USA; Southern Methodist Mustangs head coach Larry Brown reacts during the second quarter of a mens basketball game against the UCF Knights at Moody Coliseum. SMU won 70-55. Don’t bother throwing Mardi Gras beads at Larry Brown. SMU’s Hall of Fame basketball coach is no fan of Fat Tuesday. Brown noticed empty seats in the student sections during Saturday’s 70-55 win over UCF, despite the game officially being a sellout. He made a point of expressing his disappointment in his postgame press conference. "I didn’t see all our students," Brown said. "That kind of bugged me a little bit. Maybe it’s the weather. Is there a beach around here?" Brown’s comment drew laughter from reporters. Then someone mentioned that a lot of students were probably in New Orleans for Mardi Gras. "Mardi Gras, that’s what I heard," Brown said. "Great programs, no matter who you play, they’re there. I don’t take it lightly, the support we’ve had has been great. They’ve meant a lot to us." Crowd support, in particular from the students, has been a big part of No. 23-ranked SMU’s resurgence this season. The Mustangs have sold out six games and all tickets to Wednesday’s game against No. 7 Louisville have already been snatched up. Students have camped out in freezing weather to get seats. But even a Top 25 team has a hard time competing with Mardi Gras for students’ attention. "Is Mardi Gras on Wednesday?" Brown asked later. Brown was then informed that Mardi Gras is a weekend-long celebration culminating in Fat Tuesday, March 4. Brown then recalled his days in the late 1960s as a player with the New Orleans Buccaneers of the old ABA. "I played down there," Brown said, pausing. "They came to our games." SMU is 15-0 at home this season, including 9-0 since Moody Coliseum (capacity 7,086) re-opened after a major renovation in January. The noisy crowds have been a factor in games like the 21-point win over then-No. 7 Cincinnati last month. "I want people to dread coming in here," Brown said. "We’re not going to be able to hang with Louisville unless we have a better crowd than we had with Cincinnati, and I didn’t think that was possible. But we’ll see." As Brown stood up to leave the press conference, he drew more laughs when he muttered with mock disgust: "Mardi Gras."